Business dynamism is the process by which firms continually are born, fail, expand, and contract, as some jobs are created, others are destroyed, and others still are turned over. Research has firmly established that this dynamic process is vital to productivity and sustained economic growth. Entrepreneurs play a critical role in this process, and in net job creation. 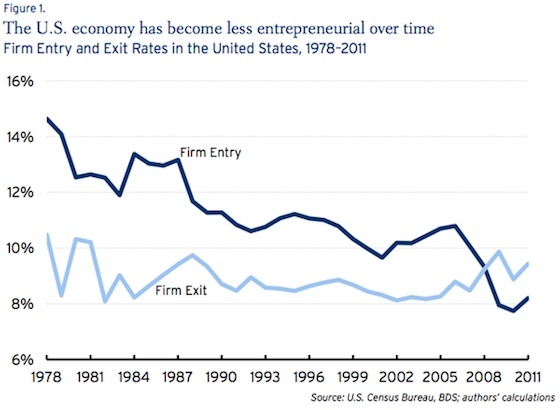 While the reasons explaining this decline are still unknown, if it persists, it implies a continuation of slow growth for the indefinite future, unless for equally unknown reasons or by virtue of entrepreneurship enhancing policies (such as liberalized entry of high-skilled immigrants), these trends are reversed. The Nevada County Economics Resource Council has identified weak entrepreneurship in Nevada County as an impediment to economic development. Our schools do not teach entrepreneurship, but even if they did, the layering on of more and more regulations at the state and national level, make business formation a higher and higher hurdle. One other reason business formation may have dropped is the crash of the housing market and specifically in the equity many have in their homes. In the real world, trying to get such an unsecured loan from a bank as a small business will at best result in laughter. My company is no longer what many would call “small” — we will do millions in revenue this year. But there is no way in the world that my banker of over 10 years will lend to my business unsecured — they will demand some asset they can put a lien on. So we can get financing of equipment purchases (as a capital lease on the equipment) and on factored receivables and inventory. But without any of that stuff, a new business that just needs cash for startup cash flow is out of luck — unless the owner has a personal asset, typically a house, on which the banker can place a lien. I believe that this is an area where people of good will regardless of ideology can work together to make progress. We need to teach, encourage, and reward entrepreneurship. We need to invest in preparing people for new job markets by investing in STEM education and vocational training. We need to invest in the backbone infrastructure that enables entrepreneurship and business growth. These things are non-partisan in nature and should be almost universally supported in Nevada County.